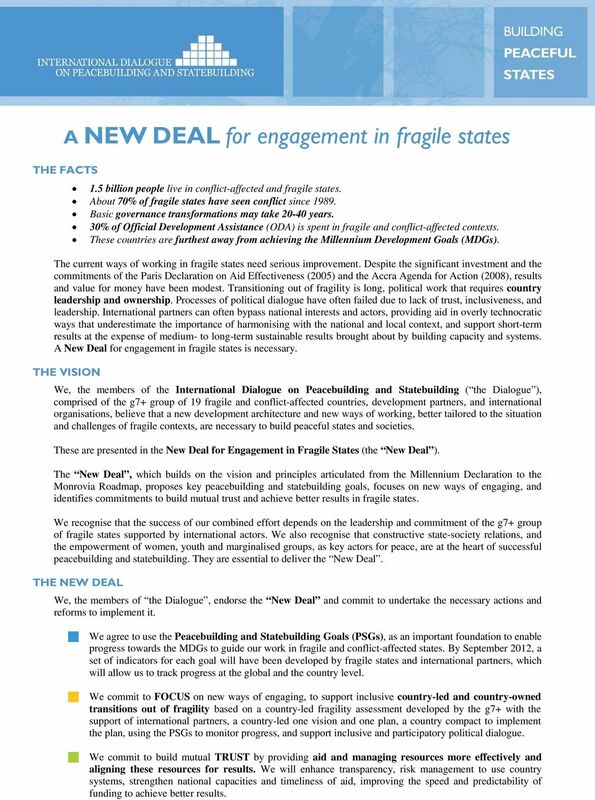 Download "A NEW DEAL for engagement in fragile states"
1 A NEW DEAL for engagement in fragile states THE FACTS 1.5 billion people live in conflict-affected and fragile states. About 70% of fragile states have seen conflict since Basic governance transformations may take years. 30% of Official Development Assistance (ODA) is spent in fragile and conflict-affected contexts. These countries are furthest away from achieving the Millennium Development Goals (MDGs). The current ways of working in fragile states need serious improvement. Despite the significant investment and the commitments of the Paris Declaration on Aid Effectiveness (2005) and the Accra Agenda for Action (2008), results and value for money have been modest. Transitioning out of fragility is long, political work that requires country leadership and ownership. Processes of political dialogue have often failed due to lack of trust, inclusiveness, and leadership. International partners can often bypass national interests and actors, providing aid in overly technocratic ways that underestimate the importance of harmonising with the national and local context, and support short-term results at the expense of medium- to long-term sustainable results brought about by building capacity and systems. A New Deal for engagement in fragile states is necessary. THE VISION We, the members of the International Dialogue on Peacebuilding and Statebuilding ( the Dialogue ), comprised of the g7+ group of 19 fragile and conflict-affected countries, development partners, and international organisations, believe that a new development architecture and new ways of working, better tailored to the situation and challenges of fragile contexts, are necessary to build peaceful states and societies. These are presented in the New Deal for Engagement in Fragile States (the New Deal ). 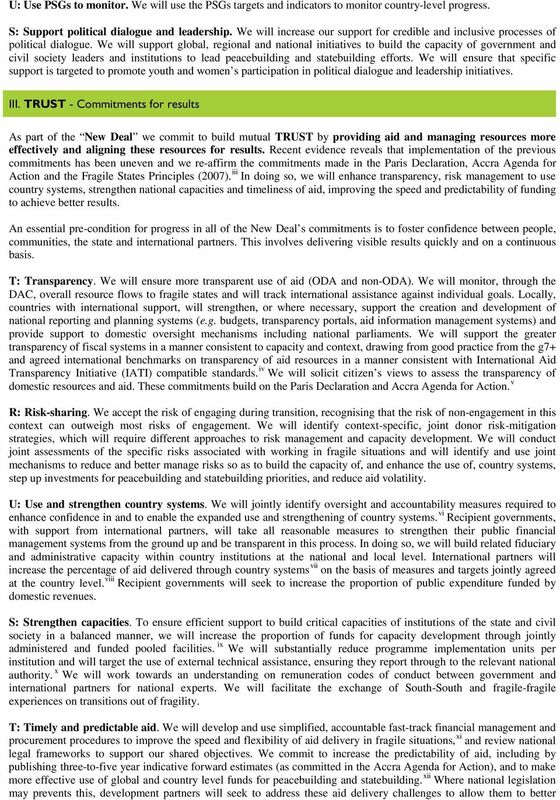 The New Deal, which builds on the vision and principles articulated from the Millennium Declaration to the Monrovia Roadmap, proposes key peacebuilding and statebuilding goals, focuses on new ways of engaging, and identifies commitments to build mutual trust and achieve better results in fragile states. We recognise that the success of our combined effort depends on the leadership and commitment of the g7+ group of fragile states supported by international actors. We also recognise that constructive state-society relations, and the empowerment of women, youth and marginalised groups, as key actors for peace, are at the heart of successful peacebuilding and statebuilding. They are essential to deliver the New Deal. THE NEW DEAL We, the members of the Dialogue, endorse the New Deal and commit to undertake the necessary actions and reforms to implement it. We agree to use the Peacebuilding and Statebuilding Goals (PSGs), as an important foundation to enable progress towards the MDGs to guide our work in fragile and conflict-affected states. By September 2012, a set of indicators for each goal will have been developed by fragile states and international partners, which will allow us to track progress at the global and the country level. We commit to FOCUS on new ways of engaging, to support inclusive country-led and country-owned transitions out of fragility based on a country-led fragility assessment developed by the g7+ with the support of international partners, a country-led one vision and one plan, a country compact to implement the plan, using the PSGs to monitor progress, and support inclusive and participatory political dialogue. We commit to build mutual TRUST by providing aid and managing resources more effectively and aligning these resources for results. We will enhance transparency, risk management to use country systems, strengthen national capacities and timeliness of aid, improving the speed and predictability of funding to achieve better results. 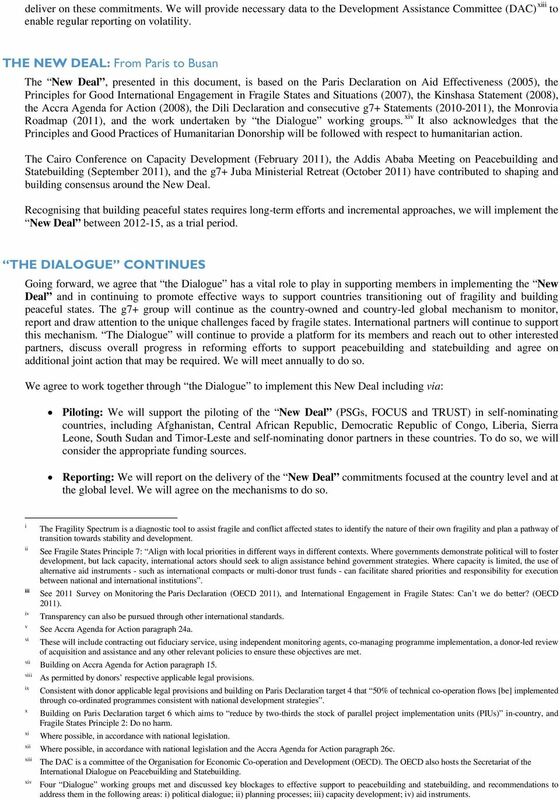 2 THE NEW DEAL: The details I. Peacebuilding and Statebuilding Goals - PSGs We, the members of the Dialogue, agree to use the Peacebuilding and Statebuilding Goals (PSGs) as an important foundation to enable progress towards the MDGs and to guide our work in fragile and conflict-affected states. The five goals are: Legitimate Politics - Foster inclusive political settlements and conflict resolution Security - Establish and strengthen people s security Justice - Address injustices and increase people s access to justice Economic Foundations - Generate employment and improve livelihoods Revenues & Services - Manage revenue and build capacity for accountable and fair service delivery The PSGs will guide the identification of peacebuilding and statebuilding priorities at the country level. They will inform the national vision, plan and a country-level compact to implement the plan. They will inform global and country-level funding decisions to help ensure that all fragile countries, and their key peacebuilding and statebuilding priorities, are supported. By September 2012, a set of indicators for each goal will have been developed by fragile states and international partners, which will allow us to track progress at the global and the country levels. These indicators will combine objective measures with measures to understand the views of people on results achieved. We will work towards full consideration of the PSGs in the post-mdg development framework beyond 2015 and, after Busan, towards the consideration of the PSGs by the 2012 United Nations General Assembly and other fora. II. FOCUS - Engagement to support country-owned and -led pathways out of fragility As part of the New Deal we commit to FOCUS on new ways of engaging, to support inclusive country-led and country-owned transitions out of fragility based on a country-led fragility assessment developed by the g7+ with the support of development partners, a country-led one vision and one plan, a country compact to implement the plan, using the PSGs to monitor progress, and support inclusive and participatory political dialogue. We recognise that an engaged public and civil society, which constructively monitors decision-making, is important to ensure accountability. F: Fragility assessment. We will conduct a periodic country-led assessment on the causes and features of fragility and sources of resilience as a basis for one vision, one plan. The assessment will include key national stakeholders and nonstate actors and will build upon a harmonised methodology, including a fragility spectrum, i to be developed by the g7+ and supported by international partners. O: One vision, one plan. We will develop and support one national vision and one plan to transition out of fragility. This vision and plan will be country-owned and -led, developed in consultation with civil society and based on inputs from the fragility assessment. Plans will be flexible so as to address short-, medium- and long-term peacebuilding and statebuilding priorities. The country-led plan will be the guiding framework for all country-led identification of priorities. They will be monitored, reviewed and adjusted in consultation with key stakeholders on an annual basis. C: Compact. A compact is a key mechanism to implement one vision, one plan. A compact will be drawn upon a broad range of views from multiple stakeholders and the public, and be reviewed annually through a multi-stakeholder review. 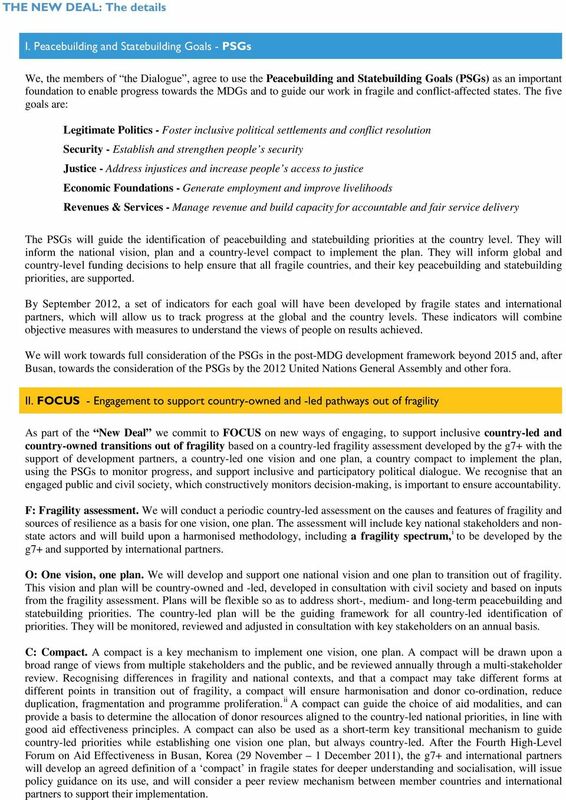 Recognising differences in fragility and national contexts, and that a compact may take different forms at different points in transition out of fragility, a compact will ensure harmonisation and donor co-ordination, reduce duplication, fragmentation and programme proliferation. ii A compact can guide the choice of aid modalities, and can provide a basis to determine the allocation of donor resources aligned to the country-led national priorities, in line with good aid effectiveness principles. A compact can also be used as a short-term key transitional mechanism to guide country-led priorities while establishing one vision one plan, but always country-led. After the Fourth High-Level Forum on Aid Effectiveness in Busan, Korea (29 November 1 December 2011), the g7+ and international partners will develop an agreed definition of a compact in fragile states for deeper understanding and socialisation, will issue policy guidance on its use, and will consider a peer review mechanism between member countries and international partners to support their implementation. 4 deliver on these commitments. We will provide necessary data to the Development Assistance Committee (DAC) xiii to enable regular reporting on volatility. THE NEW DEAL: From Paris to Busan The New Deal, presented in this document, is based on the Paris Declaration on Aid Effectiveness (2005), the Principles for Good International Engagement in Fragile States and Situations (2007), the Kinshasa Statement (2008), the Accra Agenda for Action (2008), the Dili Declaration and consecutive g7+ Statements ( ), the Monrovia Roadmap (2011), and the work undertaken by the Dialogue working groups. xiv It also acknowledges that the Principles and Good Practices of Humanitarian Donorship will be followed with respect to humanitarian action. The Cairo Conference on Capacity Development (February 2011), the Addis Ababa Meeting on Peacebuilding and Statebuilding (September 2011), and the g7+ Juba Ministerial Retreat (October 2011) have contributed to shaping and building consensus around the New Deal. Recognising that building peaceful states requires long-term efforts and incremental approaches, we will implement the New Deal between , as a trial period. THE DIALOGUE CONTINUES Going forward, we agree that the Dialogue has a vital role to play in supporting members in implementing the New Deal and in continuing to promote effective ways to support countries transitioning out of fragility and building peaceful states. The g7+ group will continue as the country-owned and country-led global mechanism to monitor, report and draw attention to the unique challenges faced by fragile states. International partners will continue to support this mechanism. The Dialogue will continue to provide a platform for its members and reach out to other interested partners, discuss overall progress in reforming efforts to support peacebuilding and statebuilding and agree on additional joint action that may be required. We will meet annually to do so. We agree to work together through the Dialogue to implement this New Deal including via: Piloting: We will support the piloting of the New Deal (PSGs, FOCUS and TRUST) in self-nominating countries, including Afghanistan, Central African Republic, Democratic Republic of Congo, Liberia, Sierra Leone, South Sudan and Timor-Leste and self-nominating donor partners in these countries. To do so, we will consider the appropriate funding sources. Reporting: We will report on the delivery of the New Deal commitments focused at the country level and at the global level. We will agree on the mechanisms to do so. i ii iii iv v vi vii viii ix x xi xii xiii xiv The Fragility Spectrum is a diagnostic tool to assist fragile and conflict affected states to identify the nature of their own fragility and plan a pathway of transition towards stability and development. See Fragile States Principle 7: Align with local priorities in different ways in different contexts. Where governments demonstrate political will to foster development, but lack capacity, international actors should seek to align assistance behind government strategies. Where capacity is limited, the use of alternative aid instruments - such as international compacts or multi-donor trust funds - can facilitate shared priorities and responsibility for execution between national and international institutions. See 2011 Survey on Monitoring the Paris Declaration (OECD 2011), and International Engagement in Fragile States: Can t we do better? (OECD 2011). Transparency can also be pursued through other international standards. See Accra Agenda for Action paragraph 24a. These will include contracting out fiduciary service, using independent monitoring agents, co-managing programme implementation, a donor-led review of acquisition and assistance and any other relevant policies to ensure these objectives are met. Building on Accra Agenda for Action paragraph 15. As permitted by donors respective applicable legal provisions. Consistent with donor applicable legal provisions and building on Paris Declaration target 4 that 50% of technical co-operation flows [be] implemented through co-ordinated programmes consistent with national development strategies. Building on Paris Declaration target 6 which aims to reduce by two-thirds the stock of parallel project implementation units (PIUs) in-country, and Fragile States Principle 2: Do no harm. Where possible, in accordance with national legislation. Where possible, in accordance with national legislation and the Accra Agenda for Action paragraph 26c. The DAC is a committee of the Organisation for Economic Co-operation and Development (OECD). The OECD also hosts the Secretariat of the International Dialogue on Peacebuilding and Statebuilding. Four Dialogue working groups met and discussed key blockages to effective support to peacebuilding and statebuilding, and recommendations to address them in the following areas: i) political dialogue; ii) planning processes; iii) capacity development; iv) aid instruments. WHAT DO WE KNOW ABOUT MULTILATERAL AID? WHAT DO WE KNOW ABOUT MULTILATERAL AID? The 54 billion dollar question Multilateral aid has a vital role to play in responding to global challenges such as food security, climate change, and conflict. Three Year Strategic Plan 2012 2014 Cover: Tunis, Tunisia. A woman lifts her hands while listening to one of many impromptu speeches during a demonstration in downtown Tunis. Holly Pickett/Redux Pictures.